The fez takes its name from the Moroccan city of Fes, which served as its primary place of manufacture. This site is the origin of the berries used to create the crimson color that decorated this headwear which became fashionable across the Ottoman Empire in the 17th century. Sultan Mahmud II adopted it as part of the military uniform in an effort to modernize, banning the turban which had been the popular fashion of the time. 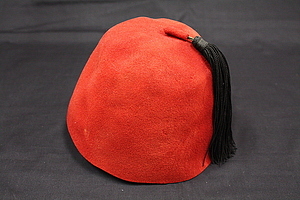 Wearing the fez spread in popularity, becoming a symbol of the region. At the turn of the 20th century, its influence spread and it became a fashionable accessory in the luxury smoking outfit in the United States and Britain because of its “exotic” cultural associations. In 1925, in an attempt to modernize the image of the country, the Turkish president, Mustafa Kemal Atatürk, passed legislation to imprison men for wearing the fez. My love of the long-running British television show Doctor Who is what brought me to this object initially. The Eleventh Doctor, played by Matt Smith, is full of random obsessions, one of which is this particular style of hat. I am find this object endearing due to my J-Term study abroad experience in Turkey. I became increasingly fascinated by Turkish culture and enjoyed the chance to immerse myself in this historically rich nation. Although the men of Turkey no longer wear the fez as part of their everyday dress, it still brings me back to the many great memories I have of traveling in this exciting country. Geishas were traditional female entertainers skilled in music, dance, and the art of dialogue. Geishas-in-training were called maiko, and marked their identity as distinct from fully-trained geisha through excessive hairdressing and face paint. A maiko headdress weighed roughly 6 pounds, took hours to make, and was generally only unraveled once a month and hair washed thoroughly. 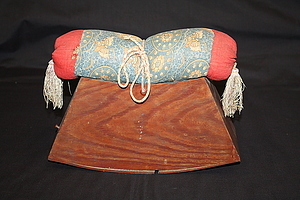 Special pillows like this one, called takamakura, were needed to keep their elaborate hairstyles intact while sleeping. For the sake of the art and effort taken into forging the difficult hairstyles, the maiko had to sleep completely still on these pillows. Based on the materials and its condition, this pillow is likely from the early 20th century, before Japan’s loss in World War II brought an end to such traditional arts of the geisha. It was a profession held in high esteem, especially during the Tokugawa Shogunate (or Edo Period, A.D. 1603-1867) until western influence brought new arts to the country. This object is of interest to me due to my love for Japanese culture, both traditional and modern. I studied abroad in Japan during the 2012-2013 academic year, during which my fascination with Japan grew. The transformation of their culture from the old to the new after WWII and the quick advancement to becoming one of the most technologically advanced nations in the world while still maintaining old components of expression has always been a source of amazement for me. This geisha pillow represents a small part of an old world so very different from the Japan we see today. The tantō is a traditional Japanese short sword that was invented during the Heian period (A.D. 794 – 1185) as a practical weapon. Traditionally, a tantō would be no more than one shaku (30cm) in length and forged in a hira-zukuri style, meaning that the blade is essentially flat without a ridgeline. As tantōs became more prevalent during the Kamakura period (A.D. 1185 – 1333), increasingly intricate designs developed on the sheath and handle. During this time the tantō served as an auxiliary weapon, the shorter of the two swords worn by the samurai. Later, during the Edo period (A.D. 1603 – 1867), the tantō became the focus of one of the central martial arts practiced at the time called tantojutsu. 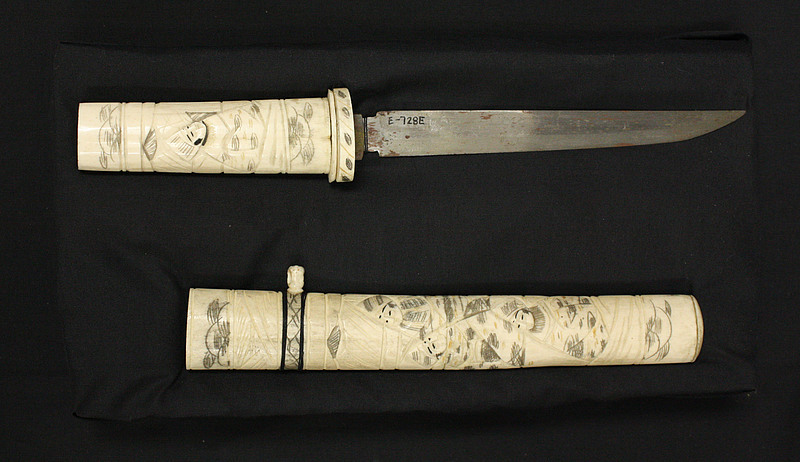 This tantō in our collection is one of the more embellished examples of this weapon, likely dating from the Edo period. I chose this particular object from the ethnographic collection as I have a deep, long-standing interest in Japanese language, culture and history, especially with regards to the shogunate. This item was donated by Adolphus Eugene Gunderson, a graduate of Luther Seminary. He started work as a missionary in Africa in 1912 in Nigeria, though his dream was to work in Sudan. After returning from his first African mission in 1916 he started campaigning to begin work in Sudan. However, WWI made this impossible. Instead, he went to Cameroon to establish a new mission. This became known as the Sudan mission because of a possible Sudanese dialect spoken by the local people. These people are known as the Gbaya, who live in central Cameroon. Unfortunately there is very little information on the Gbaya. During his time in Cameroon he collected a number of items from the local people; one of these was this bow. The bow would have been used for hunting and/or warfare. I found this object fascinating because I have an interest in warfare archaeology. Weapons technology, while being only a small part of warfare, is still extremely interesting to me. After selecting this object it only became more intriguing because it is something of a mystery as I could not find any information on the culture the item came from.